One of Van Gogh’s famous masterpieces, The Starry Night has inspired countless of works over the years. So it wasn’t surprising that it eventually turned up to become a party theme—and for a first birthday, nonetheless! What we loved about young Pierre’s celebration were the dream-like visual elements and soothing blue hues from the painting. The amazing creatives at Party Divas PH definitely outdid themselves in styling this fascinating party inspiration. Everything was beautifully captured through the lens of Prime Studios Event Cinematography. So let’s take a psychedelic trip down the memory lane of this phantasmagoria of a party! Stepping inside, the ambiance feels like the perfect setup for nighttime dreaming! Swags in midnight blue and inky black festooned the ceilings while fairy lights mimicked bright, twinkling stars. Paper lanterns in shades of blue made for the clouds up in the sky! Golden stars and playfully stylized clouds were, shall we dare say, like a crowning glory in the midst of the overhead décor. We loved how the humongous, picturesque backdrop was inspired by Van Gogh’s original surreal artwork, but something completely different. There was the trademark swirls in white and dreamlike hues of blue all over, both of which we absolutely adored! Each table had a delightful centerpiece creatively made up of shiny stars and whimsical skies, lending a dreamy vibe to the entire setup. It was such a masterpiece in itself that’s oh-so wonderful to look at! 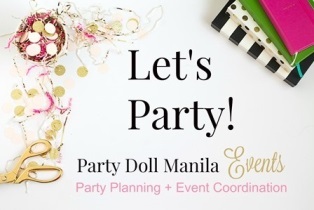 And at Party Doll Manila, we love anything that screams details and chock-full of whimsy! Li’l Pierre’s blue birthday cake was such a piece de resistance, from top to bottom. Done in drip cake design, the imaginative confection was a colorful fantasy feast to the eyes! Sweets like macarons, chocolates, and caramels were the sweetest icing on the cake—literally! You know what made everything sweeter during Pierre’s fete? Desserts, of course! Luscious cupcakes, delectable tiramisu cups, and yummy buko jelly were for everyone to gobble up! We even spotted a jar full of our beloved kiddie treat—iced gems! Kids and kids at heart definitely had a great time at the party. There were fun, exciting games for the young ones and feeling young, and a mind-blowing magic show for everyone to enjoy. True to its starry night concept, there was a charming photowall that’s totally Insta-worthy. A huge, sleeping crescent moon sat atop clouds and surrounded by golden stars where guests had a grand time snapping photos during Pierre’s fete. Spot the gigantic P that was such a scene-stealer! It looked like li’l pea Pierre had a fantastic time when he marked his first-year milestone with his adoring parents, friends, and loved ones. We hope that he grows up to be an amazing kid whose head is full of dreams, hands that love to create, and feet to reach his destination. Cheers to every amazing supplier who brings The Starry Night to life!